BEIJING - Beijing will reject any ruling by an international tribunal in a contentious case brought by the Philippines over the South China Sea, the foreign ministry said, as tensions mount over the disputed waters. The United Nations-backed Permanent Court of Arbitration (PCA) said Wednesday it will rule on July 12 in a closely watched case challenging China's claims to much of the strategic waterway. Beijing has consistently rejected the tribunal's right to hear the case and has taken no part in the proceedings, mounting a diplomatic and propaganda drive to try to undermine its authority. "With regard to territorial issues and maritime delimitation disputes, China does not accept any means of third party dispute settlement or any solution imposed on China," foreign ministry spokesman Hong Lei said in a statement on its website. The tribunal was "established on the basis of illegal conduct and claims of the Philippines" and "has no jurisdiction over the relevant matters", he said. Spanning more than three years, two hearings and nearly 4,000 pages of evidence, the arbitration case in The Hague is extremely complex. China claims most of the sea, even waters approaching neighboring countries, based on a vaguely defined "nine-dash" Chinese map dating back to the 1940s. 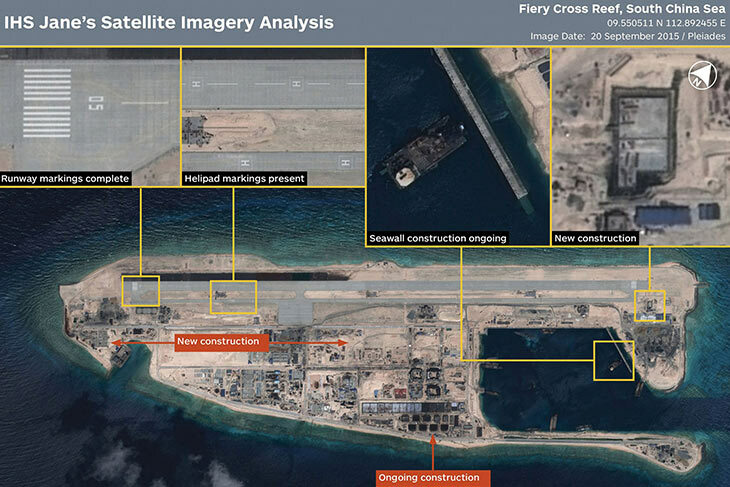 In recent years has rapidly built up reefs and outcrops into artificial islands with facilities capable of military use. As well as the Philippines, several other littoral states have competing claims, and the dispute has also embroiled the United States, which has defence treaties with allies in the region. "I hereby once again emphasise that the Arbitral Tribunal has no jurisdiction over the case and the relevant subject matter, and that it should not have heard the case," Hong said in the statement, released late Wednesday.